Have you ever tried a dessert that you just couldn’t stop eating? Well, for me, these bars are it! First, the recipe starts with a chocolate shortbread crust. When you take the crust out of the oven you immediately sprinkle chocolate chips on top and let them melt. Chocolate on top of chocolate! After the chocolate crust is cooled that’s when you add the gooey, perfect topping. There is 3 cups of pecans in the topping so there’s no spot left bare! At first I was worried that the topping would be too sweet but once I bit into these bars there was no going back. 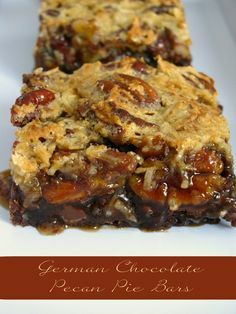 You have to make these bars! The recipe is made in a 9X13 and I think I ate half the pan myself. Really….I did! If you do end up making them, make sure you don’t have company coming over because, I promise you, you won’t want to share! 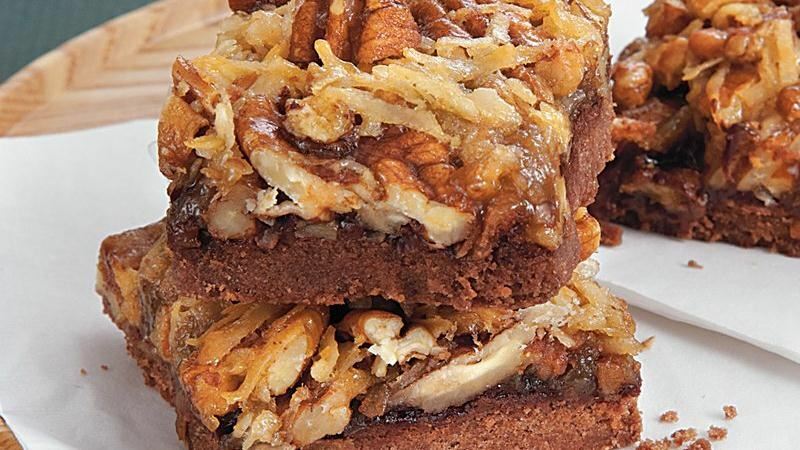 These bars are filled with gooey chocolate, pecans, and coconut. A perfect treat to have with a cup of tea or coffee. Spread pecans evenly on a cookie sheet with parchment paper and toast for about 8-10 minutes, stirring halfway through. Remove pecans and let cool. Prepare a 9X13 pan by lining it with foil (letting it hang over the edges) and lightly grease. Set aside. In a medium size bowl, whisk together flour, icing sugar, and cocoa. Add the cold butter and combine with a pastry blender or food processor until it resembles coarse meal. Press the mixture into the bottom of the prepared pan. Bake for 15 minutes. Remove from oven and immediately sprinkle milk chocolate chips over top crust. Allow to cool completely. In a stand mixer, add eggs and beat lightly. Add brown sugar, corn syrup, and melted butter and mix until smooth. Remove bowl and add in pecans and coconut, hand stir until combined. Pour over crust. Bake for about 30-35 minutes or until edges are golden and filling is set. Refrigerate for about an hour or overnight to allow bars to set. Using the foil overhang, remove bars from pan and remove foil. You can set the bars back in the pan for storage or set on a cutting board. Using a sharp knife, cut into squares.